SALINEVILLE — The Eastern Ohio Athletic Conference boys basketball title race may be over, but Southern Local is doing its best to take second place. Cam Grodhaus scored 15 of his game-high 22 points in the second half as Southern rallied past United, 57-52, Tuesday. 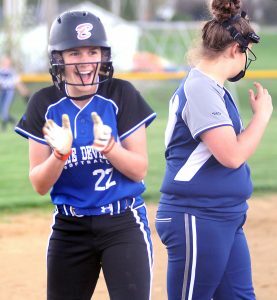 Losses by United and Wellsville on Tuesday gave Toronto a share of its second-straight EBC title without even playing. Toronto is 10-0 in the EOAC, while Southern, United and Wellsville are in second place with four losses each. Sophomores Brock Smalley and Brady Tolson aided the winning effort as Smalley collected 10 points and four assists and Tolson totaled nine points and 16 rebounds. Grodhaus added seven rbounds and two steal and Tyler Roush had three blocked shots. Southern improves to 10-4 overall and 7-4 in the EOAC, while United moves to 8-6 and 6-4 EOAC. The Eagles got out to a 16-9 lead in the first quarter with nine points from Landon Baker and seven from Parker Hydrick. Baker finished with 18 points and eight rebounds and Hydrick added 11 points. The Eagles shot 11-of-23 from the foul line, including 7-of-16 in the second half. Southern also won the junior varsity game, 57-28. Nick Utt scored 13 points and Timmy West nine for the Indians. Nate Miller led United with seven points. Both teams play Friday as Southern visits East Palestine and United hosts Wellsville. UNITED SCORING: Parker Hydrick 4-3-11, Ethan Antram 3-1-9, Brutus Ogilvie 1-0-2, Landon Baker 8-2-18, Alex Birtlan 2-1-6, Keaton Baker 1-3-5, Anthony DiBaggio 0-1-1, Nick Rhodes 0-0-0. TEAM TOTALS: 19, 11-23: 52. SOUTHERN SCORING: Brock Smalley 4-1-10, Cam Grodhaus 9-3-22, Nick May 0-0-0, Bradly Sloan 1-3-5, Jayce Sloan 3-0-6, Josh Pratt 1-0-3, Max Hart 0-0-0, Tyler Roush 1-0-2, Brady Tolson 3-3-9, Tanner Patterson 0-0-0. TEAM TOTALS: 21, 10-15: 57. Three-point goals: United 3 (Antram 2, Birtalan), Southern 3 (Smalley, Grodhaus, Pratt). LEAVITTSBURG –South Range’s boys basketball got 19 points from Chris Brooks as the Raiders upset LaBrae 54-52 on Tuesday. LaBrae was ranked 10th in Div. III in the latest Associated Press poll. Nick Matos added 10 points for the winners, 11-4. South Range hosts Lakeview on Friday. The Raiders won the jayvee game, 64-38. S. RANGE SCORING: Jaxon Anderson 3-0-6, Ben Irons 0-0-0, Chris Brooks 9-1-19, Nick Matos 4-0-10, Dante Digaetano 3-1-7, CJ Brown 2-0-4, Sam Brooks 0-0-0, Brandon Mikos 3-0-8. TEAM TOTALS: 24, 2-4: 54. LABRAE SCORING: C. Meyer 4-4-15, Rutherford 1-0-2, Whiteside 2-0-4, Tennant 2-0-6, Stephens 9-1-23, Z. Meyer 0-2-2. TEAM TOTALS: 18, 7-10: 52. MCDONALD — Springfield survived a 44-point onslaught from Zach Rasile as it turned back McDonald 74-69 on Tuesday. Three Tigers scored more than 20 points — Shane Eynon 23, Drew Clark 22, Evan Ohlin 20 — in the win. Springfield is 12-1 and 8-1 in the Mahoning Valley Athletic Conference. The Tigers are at Sebring on Friday. SPRINGFIELD SCORING: Evan Ohlin 8-0-20, Clay Medvec 1-1-4, Drew Clark 8-3-22, Garrett Stallsmith 1-0-2, Shane Eynon 10-3-23, Beau Brungard 1-1-3. TEAM TOTALS: 29, 8-16: 74. MCDONALD SCORING: Zach Rasile 15-2-44, Josh Celli 1-0-2, Cam Tucker 1-0-2, Ryan Scaia 2-2-6, Jack Portolese 5-2-13, Tanner Matig 1-0-2. TEAM TOTALS: 25, 6-9: 69. BERLIN CENTER — Kody Zupko’s 14 points led Mineral Ridge to a 52-47 win over Western Reserve on Tuesday. Western Reserve was led by Riley Miller’s 18 points. Noah Klasic added 10 more. The Devils are 4-10 and 2-7. Mineral Ridge is 10-5, 5-4. Reserve won the jayvee game, 44-42. Gabe Platt had 20 points for the winners. M. RIDGE SCORING: Governor 4-1-11, Zupko 5-2-14, Weiss 1-2-4, Zupko 5-2-12, Clark 2-1-7, Rozzi 2-0-4. TEAM TOTALS: 23, 6-13: 52. W. RESERVE SCORING: Riley Miller 7-0-18, Todd Henning 0-0-0, Noah Klasic 4-0-10, Preston Reed 3-1-7, Ryan Gordon 1-0-3, Jake Moore 3-0-9, Caleb Quinn 0-0-0. TEAM TOTALS: 20, 1-3: 47. CAMPBELL — Campbell Memorial knocked off Crestview 47-40 in All-American Conference play on Tuesday. Crestview falls to 2-10 and will host state-ranked LaBrae on Friday. Drake Golden had 16 points for the Rebels. CRESTVIEW SCORING: Brandon Yanssens 0-2-2, Dale McGoogan 0-0-0, Drake Golden 5-5-16, Dom Wycoff 2-4-8, Jude Riffle 5-2-12, Jack Yerkey 1-0-2, Anthony Cusick 0-0-0. TEAM TOTALS: 13, 13-25: 40. Three-point goals: Crestview 1 (Golden), Campbell 3 (Logan 2, Michaels).